A program of short animations and experimental film screening in the Walker’s Mediatheque on March 30 at 7 pm, East, West Home is Best is presented in conjunction with the University of Minnesota symposium “Remapping European Media Cultures During the Cold War: Networks, Encounters, Exchanges” (March 30–April 1). The story of Josef Kluge’s East, West, Home is Best (1969) has little to do with the geopolitics suggested in its title. Indeed, the film—whose Czech title, Všude dobře, doma nejlépe, is an idiom literally translated as “I’m happy everywhere, but happiest at home”—is about a young chicken. Bored with the daily routine at the nest, the tiny protagonist ventures out, finds the world outside darker and more menacing than expected, and returns home. Nevertheless, during the Cold War, the film played a role in the transnational movement of moving images between the “East” and “West” that is this symposium’s subject—movement that was complex, and often had to do not with a film’s subject or themes, but with its production and dissemination. Kluge’s film, for instance, was donated to the Ruben/Bentson collection from Film in the Cities, the renowned Twin Cities film-education program of the 1970s and 1980s, which had received the print from American avant-garde filmmaker Bruce Conner. It’s unclear how Conner got hold of the film, but the 16mm print bears opening titles in English, prepared by Czechoslovakia’s film-export company, Czechoslovak Filmexport. Animation was an important component of media exports from postwar Eastern Europe, many of which were sent west. Usually short, colorful, and unburdened by heavy dialogue, animated films were eminently “translatable” and brought returns in the form of hard currency and prestige. As East, West, Home is Best makes clear, they also often had a helpful openness: one can read Kluge’s chicken as an allegory for Soviet post-1968 exile and return, or for adolescence, or merely in its own absurd terms. 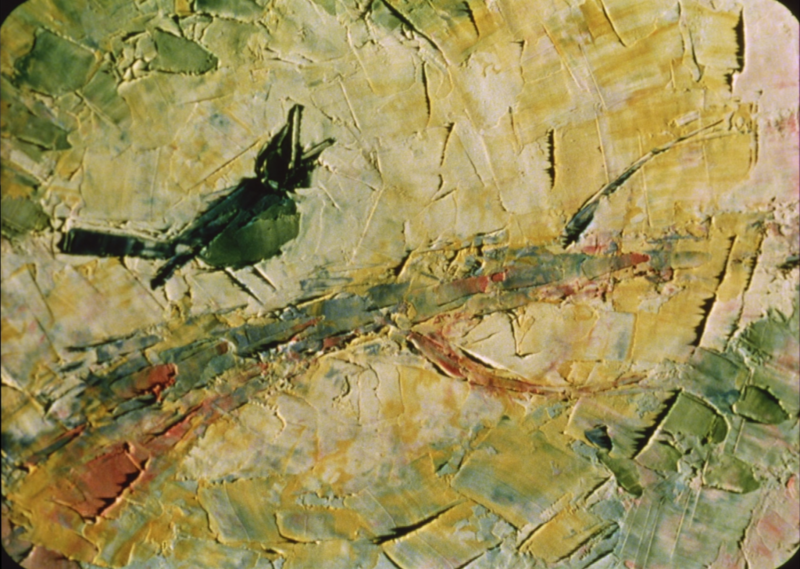 Witold Giersz’s Fire (Pożar) (1975), similarly—which, like Kluge’s film and Jan Lenica’s A (1964), is part of the Ruben/Bentson collection—is about the natural world, and as much about painting as it is about cinema. The films in this program circulated beyond and within postwar Eastern Europe in multiple ways, one of which was television. The Our Sandman films that bracket the program are a case in point: Created by puppet maker and director Gerhard Behrendt for East German television in 1959, the films were adapted into children’s television in several Western European or neutral countries, especially in the Nordic region. Travel was a key theme of the films: adopting imaginative modes of transport, the Sandman visits children around Germany and other socialist countries, as well as beyond the socialist world. The films’ popularity in the Nordic countries probably inspired one of the films in this program (written by a Finnish scriptwriter), in which Sandman travels to Lapland. Yet Senft’s and Lenica’s careers underscore that East-West dynamics in Cold War media cultures are also traced in biography. Senft was born in Czechoslovakia’s Sudetenland, in the city of České Budějovice, in 1928. Midway during the war, at the age of 15, he was drafted as a Luftwaffenhelfer (“assistant” in the German air force), and from May 1945 to May 1946 he found himself interned in the country of his birth, in camps for German expellees. He soon emigrated to Wiesbaden, West Germany, where he studied film. Lenica, who was also born in 1928, started his career as a graphic artist and poster designer in his native Poland, and began collaborating on animated films with celebrated director Walerian Borowczyk in 1957. After encountering problems with his work’s distribution, he emigrated to Paris, then West Germany, where he taught animation in Kassel and poster design and graphic arts at the Berlin Hochschule der Kunste. 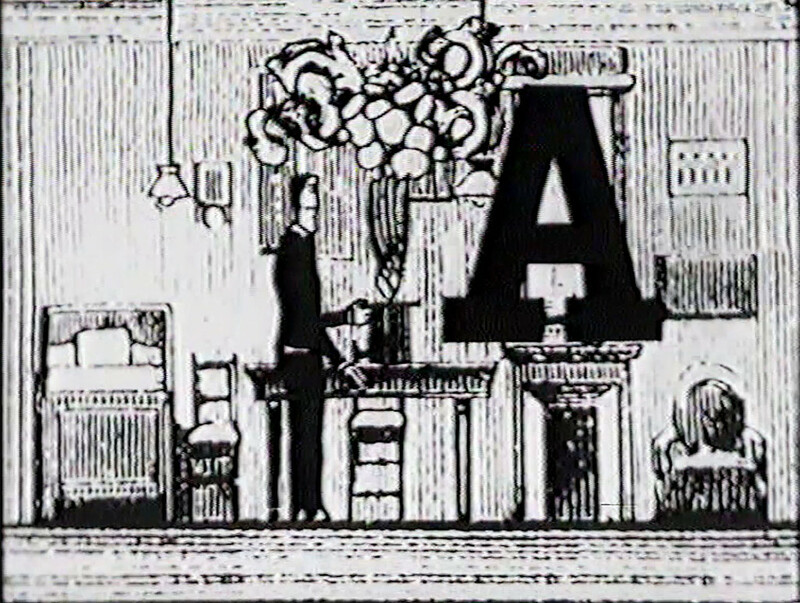 Throughout his career, Lenica collaborated with playwright Eugène Ionesco, who, like Lenica, moved between Eastern and Western Europe (in Ionesco’s case, Romania and France); A is an adaptation of themes from Ionesco. If film prints and television broadcasts moved through space, then, so did people, with Senft’s and Lenica’s careers offering two different models for emigration: one forced by World War II’s cataclysmic geopolitical shifts; one rooted in the often-constricting nature of East European media industries. This constriction is both the subject and the condition of possibility for Helke Misselwitz’s Tango Dream (1985). Here, Misselwitz, a key director in East Germany’s DEFA Studio for Documentary Films, depicts an East German filmmaker confronting the question of how she can make a film about Buenos Aires and Montevideo without being able to travel there. Movement, in the film, thus occurs through other means: as the film’s title suggests, in dreams and in sound, the latter a means of transmission to which physical and geographic borders mean little.